No one is too small to play their part – that’s the message that’s sent out to all students at Lianhua Primary School. To back up that statement, students are given the opportunity to volunteer for the activities that they are interested in, and encouraged to initiate their own projects and to inspire their peers to join them in their cause. By empowering students, they learn how to be self-directed collaborators, independent thinkers and active contributors who care about people and issues around them. The volunteering process helped students as much as it helped others. “Through the various projects, we want students to understand that no matter how small their effort, they can still make a difference to others. Even the tiniest act of kindness will make the world a better place,” said Mr Vincent Low, Head of Department for Character & Citizenship Education (CCE). 92 students from Primary One to Six, together with teachers and parents, did their small part to bring cheer to 450 needy families and elderly living in Choa Chu Kang. As part of the Festive Joy-Giving with Southwest Community Development Council (SCDC) project during Chinese New Year, they went door to door, delivering numerous bags which they had hand-packed with various household groceries such as detergents, rice and biscuits. The meaning of being a good neighbour came alive to the students. They learnt to take initiative when lending a hand, and be confident when interacting with others whom they may not know. “I was so happy when my parents told me that they observed me having a deeper sense of appreciation of the world around me,” said Primary Five student Ankit Rathi, who felt that he had become more confident and compassionate since participating in this Values-in-Action (VIA) activity. Similarly, Primary Five student Wang Xin Yue also found herself astounded by the impact that she could make if she set her mind to it. Together with her friends, she planned and organised the Festive Joy-Giving with Ren Ci project during Chinese New Year. 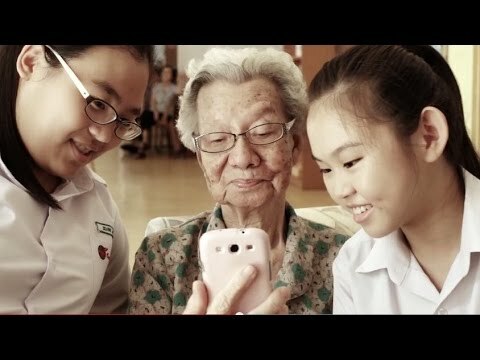 To ensure that the elderly were not lonely during the special occasion which usually revolves around family, they invited residents from Ren Ci Hospital@Bukit Batok to Lianhua Primary School to celebrate together. “When we started, we did not think that it was difficult. But we soon realised that there was so much that needed to be done, such as the recruitment of volunteers, the food order and even the transport arrangement for the elderly,” said Xin Yue, who was grateful for the help and guidance from the senior prefects and teachers. “I liked interacting with the elderly. I learnt how to communicate better with them and it was really fun talking about our experiences. My parents also noticed that I had become more patient and gave me their support,” she added. To raise money to help the needy families in the school, another group of Primary Five students volunteered for a fundraising project, in collaboration with artisans who had special needs, such as autism and cerebral palsy. Together, they made leather crafts and sold them. “When I first signed up for the project, I wanted to help people with special needs. But I realised that it was me who benefitted more from the experience. I learnt about what empathy and diligence meant. Although the leatherwork was difficult, the artisans showed us their spirit and determination,” said Akshat Rathi. Akshat was inspired as he talked to the artisans and made friends with them. He realised that people with special needs were like any other. They were people with hopes and aspirations. Mr Low hopes that his students would be inspired by the artisans to persevere and develop their own talents to the fullest. “My proudest moments are when I see the joy on the faces of the volunteers and the people whom they interacted with. To me, this is the greatest difference we can make to others,” said Mr Low. Students learn to bake while enjoying the support of their peers.